Cabin 1 "Nystova" has three bedrooms, accommodating a total of 5 people. The sleeping areas are divided into one bedroom with double bed, one room with single bed and one charming bedroom in the loft with two single beds. The living room has a dining table, sofa bed and cozy wood burning stove with wood burning stove. The kitchen has a fridge and a hob with extra hobs and is otherwise equipped with cookware, cups, dishes and cutlery. The bathroom is small and simple with shower, sink and WC. Access to washing machine in neighboring house. No smoking indoors is allowed. Pets are not allowed in the living room and bedroom. Linen NOK 75 per set. End-of-stay cleaning on departure is not included. If guests wish that the owner to do this, it costs 400 NOK. The holiday home is an older, renovated farmhouse with a lot of charm. 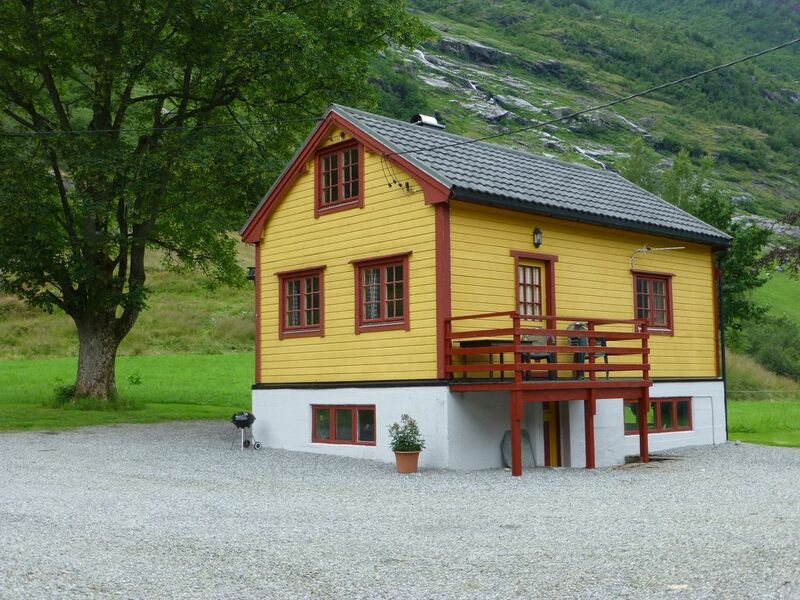 The house is quietly located on a farmhouse with views to Brenndalsbreen and Melkevollsbreen from the porch. In the yard outside the house there is ample space for children or to relax under the old trees. Guests have a small rowboat on Oldevatnet, 3 km away. To Briksdal and Briksdalsbreen it is about 3 km. To Stryn is the distance 40 km, Loen with Loen Skylift is 30 km away. Nearest town with grocery store, bank and post is Olden, 20 km away.